Think hill stations, think Mussoorie. One of the oldest hill stations established by the Britishers, Mussoorie is very popular with tourists for its foggy hills and cool winds. Located in the Garhwal hills at an altitude of 2,000 m, Mussoorie is spread on a 15 km-long saw-toothed ridge 34 km north (and uphill) of Dehra Dun. It commands a breathtaking view of the extensive Himalayan snow ranges in the north-east and the Doon Valley in the south. Mussoorie was discovered by an adventurous military officer, Captain Young, in 1827. It has everything one expects from a typical hill station - scintillating views of the valleys below, snow-capped mountains, a Mall, a skating rink and wonderful swirling mists. Air : Indian Airlines has five flights a week from Delhi to the Jolly Grant Airport. Airport: Jolly Grant is the nearest functioning airport, at a distance of 59 km. Rail : Dehra Dun is connected to major cities with super-fast trains such as the Mussoorie Express, the Bombay Doon Express, Calcutta-Howrah-Doon Express and Gorakhpur-Doon Express. The Shatabdi Express leaves New Delhi every day except Thursdays. Railway station: Dehra Dun, 34 km away, serves as the railhead for Mussoorie. Bus : There are several buses from Delhi to this hill station, both private and state-run. From Dehra Dun to Mussoorie, one can hire cabs or take any of the buses plying from just outside the Dehra Dun Railway Station. If travelling from Jammu, Saharanpur is the convenient place to catch a bus directly to Mussoorie. The road from Delhi is well maintained and the 269 km journey can be completed in six hours. The Mall : It's the hub of town. This is where the ladies and the officers of the Raj promenaded its length from the Clock Tower at Landour Bazaar to Library. For visitors today the Mall runs from where the old Picture Palace cinema used to be, to the Library. Souvenir hunters who know about the antique shop at the Clock Tower usually extend the walk to here. The middle section around Kulri is lined with scores of shops, restaurants, video parlours, and several lookout points from where you look onto the hills or down to the Doon Valley. Pick up books and comics at the Cambridge Bookshop near the old post office and opposite the landmark Raj era State Bank of India building. The ropeway to Gun Hill continues to draw the crowds. The skating rink, set along a quiet side street at Kulri is a big hit with all age groups. Jwala Devi Temple : On the top of Binog hills close to Benog Wildlife Sanctuary is Jwala Devi Temple. The hill top temple is known to bless and grant wishes of the devotees who come to seek the true blessings. Jwala Devi temple is situated within the verdant lush forest that also offers classic views of entire Mussoorie, Doon Valley, River Yamuna, Yamuna Bridge and other things. Gun Hill : Said to be an extinct volcano Gun Hill rises to a height of 400 ft above the Mall. Clamber up to get those stunning views of the surrounding hills and the valley. In the days of the Raj a cannon here used to boom out the time of the day for the townspeople. You might feel intimidated by the busy collection of restaurants and souvenir shops, but concentrate on the glorious views instead of Banderpoonch and Nag Tibba peaks. Kempty Falls : Kempty Falls, located 15 kms from Mussoorie on the Chakrata Road is one of the most popular attraction of the region. This place was developed as a tourist destination by a British officer John Mekinan, around 1835. The name Kempty is probably derived from 'camp-tea', as the British, during the colonial rule would organize their tea parties here. Surrounded by high mountain ranges and located at a high altitude of 4500 feet, the falls offer a breathtaking view as the water falling down from a high altitude of 40 feet splits further into five more streams. At Kempty, the water almost appears as if the streams are themselves doing a somersault before they hit the bottom. Nag Devta Temple : There is an ancient Nag Devta temple with is revered by the locals and tourists alike on the Cart Mackenjie Road, about 6 km from the heart of Mussoorie city. On Nag Panchami, the temple has a constant flow of visitors and devotees alike as it is considered highly auspicious to witness the pooja that is held on a large scale. The Mall is the place to go shopping while in Mussoorie. Tibetan prayer wheels, wooden boxes and pen stands, hand-carved walking sticks and Ladakhi shawls are some of the things to pick up from here. Pure Ladakhi shawls are a bit pricey, but worth it. The antique jamawar shawls carry heavy price tags, but they are worth having a look at even if not being purchased. Nowadays modern techniques are being used to weave these shawls, which have reduced their price. So, if the shopkeeper asks for the sky, bargain! Like any other tourist station, Mussoorie abounds in good eating-places. The restaurants here serve cuisines particular to all parts of India. One can check out the veggie fare laid out by Agarwal Vegetarian and Green Vegetarian at the Kulri Bazaar. Some of the other popular ones here are Amitash Restaurant, Chacha Da Hotel, Garhwal Terrace, Kwality Le Chef, Madras Cafe, Maha Lakshmi, Sher-e-Punjab and the Tavern. For entertainment check out what facilities are available at your hotel. 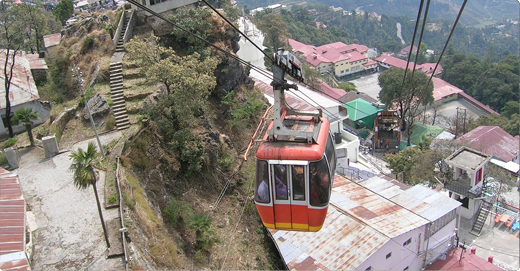 Mussoorie has more to offer in terms of sightseeing than specialized entertainment. There are hotels in Mussoorie such as Oasis Resort and Jaypee Residency Manor, which have good night clubs, but the town as such has not much to offer in terms of an active nightlife. The mini Appu Ghar and the Skating Rink at Picture Palace are two places that kids love. The rides are very basic and even toddlers can manage them. For Adventure Freaks Are you an adventure seeker? Then Mussoorie has all that you can ask for. Trekking, rock climbing, mountain biking, roller-skating - the list is endless! Trekking Walk across to Charleville and the Tibetan settlement of Happy Valley, a warm-up 3km walk from Mussoorie.